Electronic products, electric vehicles and large-scale energy storage closely related to human life create an ever-growing demand for rechargeable batteries. Lithium-ion batteries, which are currently widely used, do not perform well in terms of energy density and safety. As for rechargeable magnesium (Mg) metal batteries developed later, the lack of Mg electrolytes capable of effectively plating/stripping Mg has impeded its practical development. Recently, a research team led by Prof. Cui Guanglei from the Qingdao Institute of Bioenergy and Bioprocess Technology (QIBEBT) of the Chinese Academy of Sciences exploited a novel rigid-fexible coupling gel polymer electrolyte (PTB@GF-GPE) that coupled with significantly improved overall performance. It was synthesized via an in situ crosslinking reaction between magnesium borohydride and hydroxyl-terminated polytetrahydrofuran. Over the past few decades, although progress has been made in exploiting liquid Mg electrolytes capable of reversible Mg deposition, liquid electrolytes still pose the problem of being volatile and flammable. Compared with liquid electrolytes, polymer electrolytes have several advantages, including: no internal short circuit; no electrolyte leakage; ease of fabrication; and flexibility of structure. This gel polymer electrolyte exhibits reversible Mg plating/stripping performance, high Mg-ion conductivity, and a remarkable Mg-ion transfer number. The Mg batteries assembled with this gel polymer electrolyte not only work well at a wide temperature range (-20 to 60 °C) but also display unprecedented improvements in safety issues without suffering from internal short-circuit failure even after a cutting test. 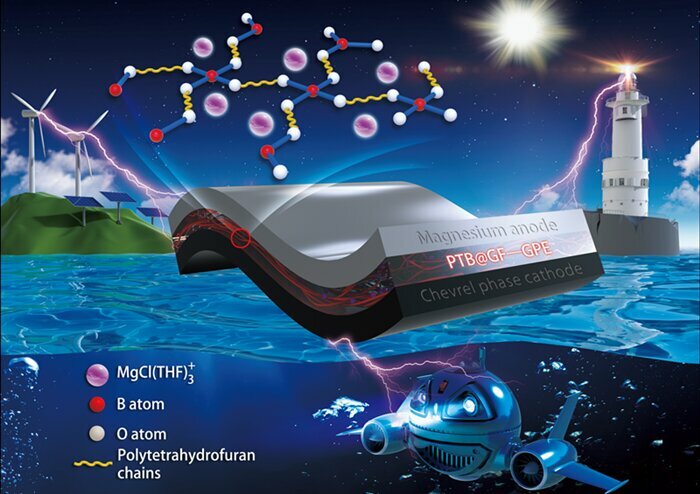 This in situ crosslinking approach toward exploiting the Mg-polymer electrolyte provides a promising strategy for achieving large-scale application of Mg-metal batteries.